I am a homeschoolin’ mama of more than ten years now. My homeschool has evolved over the years based on our circumstances and the needs of my children. I have used many different curriculum and methods. All of them were good for the times we used them and looking back now I see that homeschooling is more about the process than the materials. It is also a journey. My fondest memories of that journey are from when we were using homeschool journals. I want to share with you what a homeschool journal is, how we used these journals in our homeschool and why I feel they are a wonderful option for moms with creative and expressive children. What is a homeschool journal? Homeschool journals were where we recorded our learning. Any lined notebook would work for this. But I chose to use hardbound ledger books because they offered us lots of space for both illustrations and writing. Plus they were practical and very durable. For the years we used these journals we used no set curriculum with the exception of math. I know, it sounds radical. But I had two expressive and very creative children, both very intelligent and good readers and writers. I had also just had a baby. So I really wanted something that took the difficulty out of homeschooling for me. A structured curriculum just seemed so overly demanding for our military overseas lifestyle. I needed to find the joy in the homeschooling. At the same time I was reading up on other teaching methods, such as Charlotte Mason, to help my ADHD child. These wonderful journals were actually my husbands idea. He knew I had my hands full and offered me a solution for my overwhelmed heart. The idea for a new approach to our homeschooling was born: The Homeschool Journal. 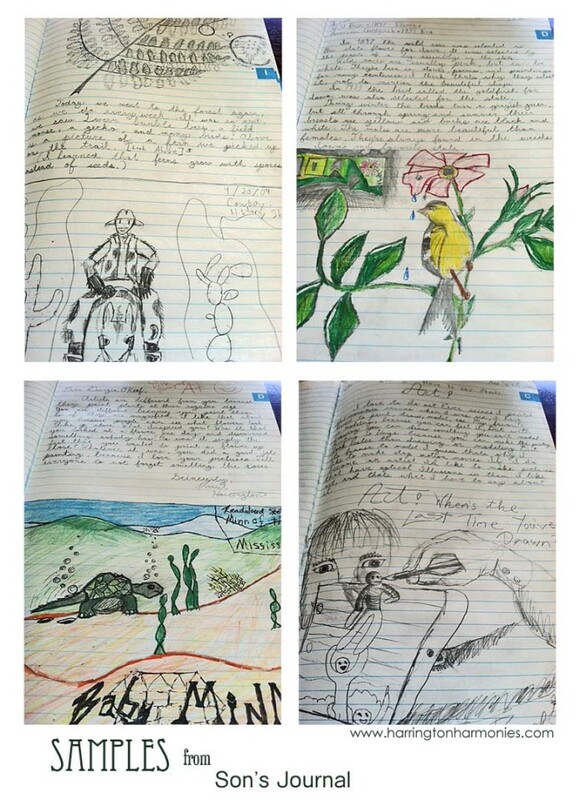 We basically used these journals for anything we explored in our learning. Every other week we switched from a history topic to a science topic. The kids picked a topic, researched it and wrote about what they learned. They also read wonderful literature and wrote book reports. In addition, they sketched and did wonderful illustrations as I read aloud to them at night. They often begged to stay up so they could keep drawing while listening to the stories. There really isn’t a limit to the types of writing, topics, and subjects that you could cover in a homeschool journal. Every homeschool could apply their own guidelines and style to their journals. 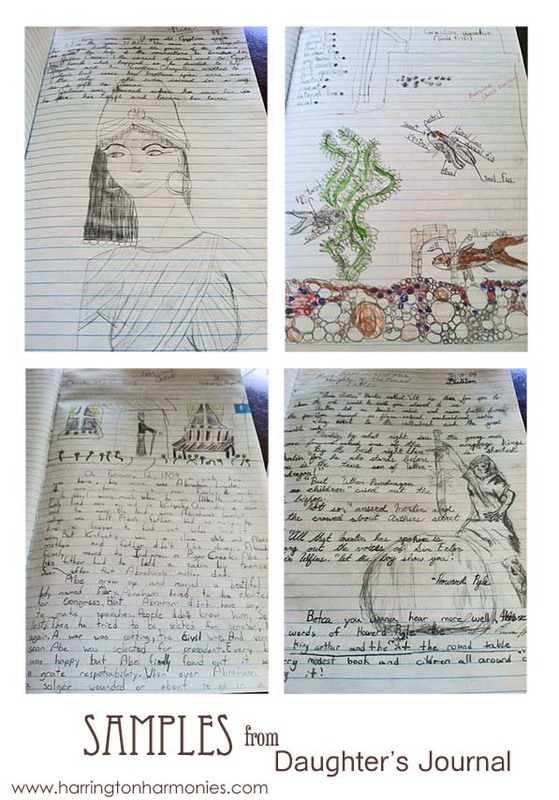 Homeschool journals are great for creative learners. My two oldest children were both creative learners. By that I mean they always wanted to express themselves. I know this isn’t always the case. My youngest child doesn’t particularly like writing and often doesn’t know “what to write about”. He also doesn’t much like drawing. So this type of journal I don’t recommend for someone like him. But I do recommend this for very expressive and artistic children. In order to use journals in this way children should be able to read and write fluently. Otherwise the idea would be very frustrating. It is perfect for a relaxed homeschool, unschooling, or a delight directed approach. It also proved to be good for providing a transition from the end of elementary to the beginning of high school, preparing them for writing papers by doing mini reports and small research papers. Over time they became wonderful and compact records of what we did during the middle school years. Just the one journal represents 2-3 years of our homeschooling. To this day they are one of my most treasured possessions and the time of homeschooling I most enjoyed. I love looking back at the good times we had exploring life together and the joy it brought our experience. 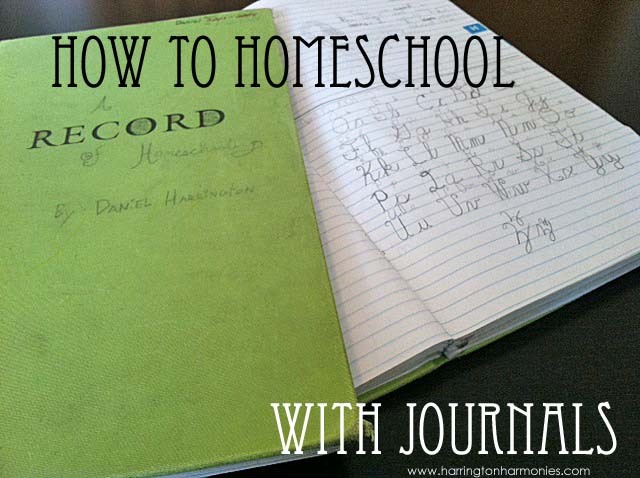 Do you, have you, or would you like to use journals in your homeschool? What types of writing would you have your children do? How would you integrate the other subjects? Stephanie has been a military spouse for 17 years and has homeschooled for 11. She is mom to three creative kids from college grad down to third grade. Her homeschool style is eclectic with Charlotte Mason and classical influences. She and her husband of 21 years serve and live wherever the US Army sends them. When she isn’t teaching, writing or moving she enjoys sightseeing, gardening, and cooking. Visit Stephanie on her blogs, Harrington Harmonies & Nature Notebook and on Facebook, Twitter & Pinterest. 3 Months With Shaklee 180 Turnaround Kit™ – Already? awesome idea! i do something similar based on my own history of keeping journals and the main lesson books used in waldorf education which become a record of yearly progress. i love the idea of ledger books, though, as they’re larger and more durable! thank you so much for sharing this beautiful idea! i have a child about to start 7th grade and i think this would be perfect, as she has grown bored with “workbook” style learning. thanks for the inspiration and God bless you! We did something similar for many years. Your children’s work looks fabulous and truly inspired. I love this idea, thank you! I’m going to incorporate this idea into this next year for a few subjects. 🙂 And the minute I saw the green covers I was certain this HAD to be another military family – and I was right! lol! Wow! You have some talented kids! At what ages were they doing these drawings? My daughter was only 3rd-4th grade in those samples and my son was 5th and 6th. I’m a visual learner so I love seeing the examples you’ve shown. We’re just starting to get more into notebooking and I’m already seeing great results! Your kids are doing really well with it. This approach will be wonderful for him! Hoping we can grow into journals, but we’re still working on reading and writing fluently. Love the samples you shared. I love this idea. I think I have to research this a little more and see how I can incorporate this now! I hope you don’t mind, I referenced this post in my latest post! Have a good day! Thank you for sharing, especially the pictures! I love that you didn’t start a new book for a new year — just let it flow like learning does! What a wonderful idea. This would be great for my daughter, but not my son. He is very much like your youngest and does not enjoy writing or drawing. Any words of wisdom or ideas to motivate him to write in a way that is not painful and torturous to us all? He is 13 years old.